97% of the impact on an audience comes from the visual message that you are conveying, not the actual text of the content itself. It has been proven that people respond differently to what they see rather than what they think they need to engage with. This is an important consideration to achieve your marketing goals with the marketing tactics and strategy that you will be executing. If your end goal is to get sales, a humorous advertisement may get people talking about your product. However, it may not transfer into sales. Likewise, a visually appealing picture may be shared virally online, but without a captivating call to action, the results of the campaign may suffer. As a marketer, you need to give people the content that appeals to them. Rather than recreating the wheel, businesses can adopt methods used in their successful campaigns and implement it into your campaign. Online, the majority of people engage with visual images. People also respond to direct messages in text. You can see this with the popularity of shared content in the forms of picture images, memes, videos and infographics. 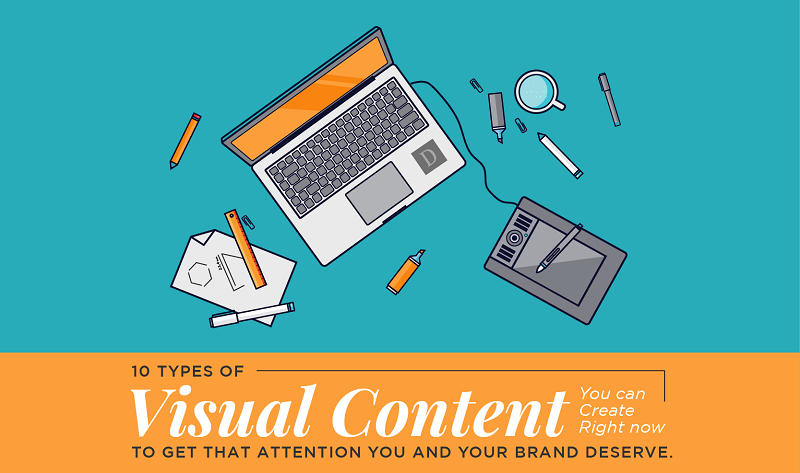 Below are some of the points to bear in mind when using visuals as a part of your content marketing. infographic courtesy of: Canva Blog. On the internet, people are looking for information. This has been the ultimate source of the internet. While the different forms have information gathering, and sharing has evolved, it is the value of the information that remains at the core of any online marketing strategy. So keep in mind that your content must offer the audience a sense of revelation. Taking in data-heavy information is challenging for people who want to take in information quickly. Data visualization makes this easier and more engaging than reading tables of quantitative or qualitative data. This has spurred the rise of infographic marketing online. For companies that seek to educate prospects as a part of their marketing plan, data visualization is a creative way to make data-heavy topics more appealing. Memes are simple, succinct, but very popular. Often done for humour, when they are done well, they can be easily shared across social networking sites and generate a massive amount of exposure. Companies can leverage the format of memes to tell and pitch their story in a similar way. Videos content presents a strong conversion opportunity for marketers. It is a great way to use content to qualify your prospect to convert them into a valued customer for your business. Youtube is the 2nd largest search engine on the internet that offers a staggering amount of traffic opportunities. There are also other video platforms on Facebook, Vine and Instagram that also offers large exposure opportunities. On Youtube, the largest markets appear to be revealing information through learning, demonstrations and reviews. This is particularly influential in the gaming, software and beauty industries. These video influencers attract large audiences through their online demonstrations and reviews. Youtube star Pewdiepie has generated a loyal following in excess of 37 million who follow his regular gameplay. Youtubers also provide complete tutorials and product recommendations, thus becoming advocates of the products and the brands. This doesn’t mean that your writing needs to be colourful. Your writing needs to create an illustrative picture for the reader. There are two types of people who will be in your audience. Those who scan information quickly (skim readers) and those who are analytical. • Make good use of headings. • Good use of highlighting text through colours, bolding, italics, fonts and quotes and sizing. • Structuring paragraphs for easy readability. • Give them takeaways so they can engage more with your content. Ensuring that you capture engagement by offering persuasion motives with your visual content. Persuasion is critical in marketing your visual content. You need to convince people to view your content, and then to view the entire length of your content, to be happy, to engage and ideally to share. Knowing how to develop the incentives in your visual content strategy will help the content to succeed. • Know the type of content your audience want to engage with. • Know your audience's mindset, whether they want to be entertained or if they are seeking to learn. • Ensure your content provides motive. You must seek to keep your audience engaged! By knowing how to maintain these incentives in your visual content, your content should perform well as a part of your marketing strategy.